Our unique and colorful dual brush pens are excellently packaged and feature the highest quality ink, dual tips, and materials. Featuring every color of the rainbow and plenty more, this one-of-a-kind brush pen set can be used to create vivid works of art that would make Van Gogh jealous. Unlike single-sided coloring brush markers, our dual tip brush pen coloring art markers feature dual tips for versatile artists who truly want their works to shine. Why be confined to a single style? Let our dual brush tip marker pens bring your visions to life. - Flexibility to create various sketches, styles, and patterns with ultimate versatility. DUAL TIP BRUSH PENS, DOUBLE VALUE: Our premium brush pens is an unprecedented value. Dual tip markers have a brush side that's outstanding for drawing, illustrating, shading, and coloring as well as a fine-point side ideal for journaling, doodling, and all of the details, there's nothing these dual brush pens can't do. Brimming with quality and jam-packed with 60 uniquely colorful pens per container, it's without a doubt these brush marker pens are one of the best values around! HIGH-QUALITY INK WITH QUICK DRY TECHNOLOGY: ENFY brush tip markers will surprise you in how quick they dry thanks to a new improved formula. You can't get it anywhere else! 60 BOLD AND PASTEL COLORS: Forget searching through art supplies trying to find the perfect brush pen set for your artistic creations. This complete set of dual brush pen art markers comes with a whopping 60 unique and vibrant color options to choose from. These dual tip markers are great for adult coloring books, drawing, coloring, sketching, doodling and just about anything else. 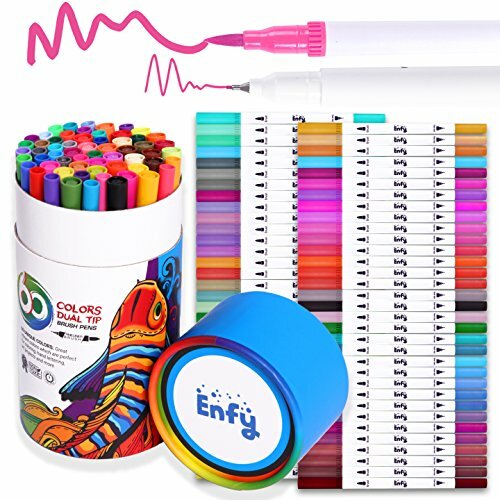 ARTISTS LOVE IT: Enfy ink delivers without skipping and doesn't smudge. Arts and crafts, student projects, sketches, and coloring books, we've got you covered with a product designed for creation! Satisfaction Guaranteed - Enfy proudly stands behind all it's products with a satisfaction guarantee. If you are unsatisfied in any way we will provide you a full refund. No questions asked. If you have any questions about this product by Enfy, contact us by completing and submitting the form below. If you are looking for a specif part number, please include it with your message.